College and middle-school students taught by Stephen Vermette, professor of geography and planning, and Stephanie Finn, science instructional coach at the Dr. Charles R. Drew Science Magnet School and coordinating teacher for the Interdisciplinary Science and Engineering Partnership (ISEP), are preparing to send a science payload to the edge of space. The experiment was one of just eight chosen by Teachers in Space Inc. (TIS) and the Perlan Project to bring space science directly into the classroom. The classroom experiments selected address such topics as atmospheric particulate density, stratospheric sampling for photosynthetic bacteria, and ion propulsion efficiency. 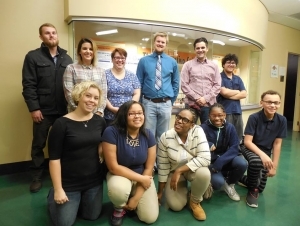 The Buffalo State and Drew Science Magnet School project addresses whether the deployment of an atmospheric net will reveal aspects of the atmosphere that cannot normally be seen from the surface. The class experiment will fly aboard the Perlan II, a manned subspace glider designed to ride stratospheric mountain waves to altitudes over 90,000 feet—a new world record for glider flight. The Buffalo team are writing and testing procedures for the TIS ground crew to assemble, launch, and retrieve the experiment at test flights from Minden, NV, in April, and for science mission flights from El Calafate, Argentina, this summer. The atmospheric net will capture samples of what might be drifting above the Earth’s surface (particles, pollen, spores, insects, etc. ), identify a few of them using electron microscopy, and to show how they differ with altitude. "I'm so honored to be a part of such an exciting endeavor! I'm looking forward to seeing what we can capture in our experiment." —Kayla Szykowny. TIS is currently seeking additional sponsors to enable teachers to join the ground crew for a week or more to operate the experimental payloads, manage experimental data, and develop sharable lesson plans based on the science and technology from these missions. "Typically in competitions the team must write procedures for the operators to follow," said explains TIS President Elizabeth Kennick. "With our Ground Crew program, teachers get to be the operators and gain real experience, learning about all of the experiments and interacting with the Perlan Project's pilots, scientists, and engineers. These teachers will be able to share the reality of experimental field work with their students together and the excitement of doing brand new research at altitudes new to extended human flight!" Vermette searches out projects for his GEG 384 Atmospheric Science course that help his students focus and make relevant course content. His connections with ISEP at the University at Buffalo and Buffalo State made Vermette aware of the TIS competition (funded in part by the Perlan Project, Airbus Group, and SpaceTEC. ), and provided an opportunity to partner with Finn. In turn, Finn selected five eighth-graders to join her in designing the experiment. This experience will serve Finn's students well as they continue on their way through high school and college. Photo: Kick-off event at the Dr. Charles R. Drew Science Magnet School. Pictured at top (left to right): Klisiewicz, Skowron, Rachel Lucas, Zachary Greymont, Atkinson, and Austen Fiannaca. Pictured at bottom (left to right): Szykowny, Cintera Quigley, Destiny Goldsmith, Kyneshi Holloway, and Anderson. Podcast: WeatherBUFF talk radio (WBNY-FM 91.3). Hosts Szykowny and Atkinson interview Vermette about the Atmospheric Net experiment.